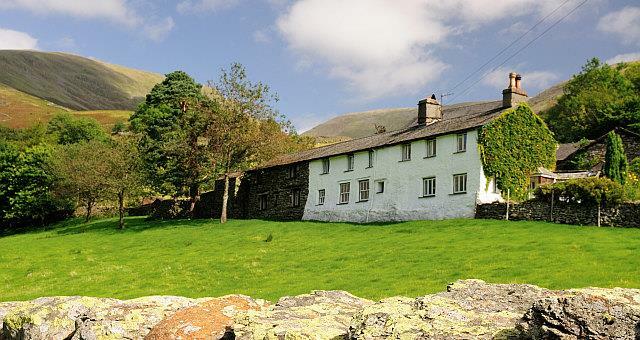 Broadrayne Farm Cottages015394 60978work015394 60977fax Self-cateringLake District self-catering holidays rarely come in a more picturesque setting. No matter what the season you will find wonderful mountain and valley walks from your door. The famous Coast to Coast walk passes through the farm's land and you can follow this trail over to Patterdale or branch off up to the Helvellyn ridge or to Fairfield. On the other side of the valley you will find the high tops around Easedale, scramble to the top of Helm Crag or take a gentle stroll around Grasmere Lake and Rydal Water. Broadrayne Farm Cottages offers weekly bookings starting on any day and sometimes short breaks. 17thC converted barn with mountain views from all rooms. On the upper ground floor a fully fitted kitchen, well equipped including dishwasher etc..., very spacious living room with a log burning stove. On lower ground floor are two bedrooms (one King, and one Super King/Twin), both are ensuite, a spare shower room and spare WC. The property is fully double glazed and Central heating is now provided by a biomass boiler fuelled by locally sourced wood chip. There is a patio garden with seating and table in the warmer months. Woolloft offers weekly bookings starting on Saturday. Lake District self-catering holidays rarely come in a more picturesque setting. No matter what the season you will find wonderful mountain and valley walks from your door. The famous Coast to Coast walk passes through the farm's land and you can follow this trail over to Patterdale or branch off up to the Helvellyn ridge or to Fairfield. On the other side of the valley you will find the high tops around Easedale, scramble to the top of Helm Crag or take a gentle stroll around Grasmere Lake and Rydal Water.